Bowing to popular demand, EnviroBecca was on the scene at GenCon in Indianapolis. Because the inspiration to make this happen didn't hit until late in the Origins recycling endeavor, a mere 24 days before GenCon, this project was coordinated with breathtaking speed. I couldn't have done it without the help of Russell Grieshop, who made many long-distance phone calls during the day (something I was unable to do from work) to arrange most of the details, and who also was my right-hand Recycling Rabbit throughout the con. We collected 2,280 containers—very close to the record set at Origins. There were 635 aluminum cans and 66 glass bottles. According to the Environmental Protection Agency, recycling them saved enough energy to light a 100-watt lighbulb for 12,964 hours, which is about a year and seven months. 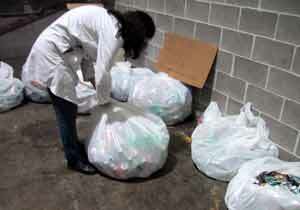 The majority of the recyclables were plastic bottles—1,579 of them—which EPA says could be spun into enough fiberfill stuffing for 197 adult-sized ski jackets, with a little left over for mittens. "…recycling [cans and glass bottles at GenCon] saved enough energy to light a 100-watt lighbulb for 12,964 hours, which is about a year and seven months." One thing that made a big difference to our recycling program was that Looney Labs has a much smaller presence at GenCon than at Origins: Instead of a major booth and a big game room and lots of tournaments, we have just a small booth. This made it impossible to store our recyclables in Looney Labs space. We needed help from the Indiana Convention Center—and we got it! Mr. Earl Craig, Director of Housekeeping Services, allowed us to use a large alcove in the loading-dock area for storage and crushing. He also hooked us up with a portable sink, which was really cool: A guy on a motorized cart brought this sink, similar to what some houses have in the laundry room, and simply connected it to water pipes on the wall and ran a hose from the sink drain to a floor drain, so within 5 minutes we had a functioning sink! The sink was around the corner from our storage area, right next to a garbage compactor. The odor was a little hard to take at times, but the location was advantageous because convention center employees pushing big carts of garbage saw what we were doing, and many of them stopped and pulled recyclables out of the trash for us! This more than made up for the few times our recycling bins were emptied into the trash by confused employees. 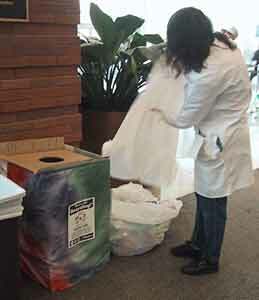 "… convention center employees pushing big carts of garbage saw what we were doing, and many of them stopped and pulled recyclables out of the trash for us!" We had a lot more recycling bins than we've ever had at Origins. Because only 7 representatives of Looney Labs were attending the con and most of them would be busy with other things, I had to use my own time as efficiently as possible. At Origins, I've tried to have a bin in every major area, and I've spent a couple of hours a day walking around the exhibit hall and asking for recyclables at every booth. At GenCon, my strategy was to place lots of bins around the exhibit hall in hopes of catching most of the recyclables being discarded there, and to put only a few bins elsewhere. Thus, there were 20 bins, and I could run around and empty all of them in less than an hour. Still, there weren't enough bins! The 15 in the exhibit hall nearly disappeared in that vast space! 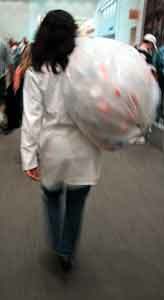 I talked to several people who recognized me but hadn't noticed a single recycling bin. Ideally, there would be a recycling bin next to every trash can. One bin for every thousand people at the con is just not enough. It was, however, about as many as we could handle with the resources we had. Rather than borrow containers from the convention center, Russell arranged to get sturdy cardboard bins from Keep Indianapolis Beautiful. These were the same size as the bins we had at Origins this year, so we could use the same type of lid made from scrap cardboard. Almost all of the bins and lids survived the con, so we dismantled them and packed them into my car for use at future events. The question of how to get enough tie-dye fabric to cover all the bins eventually led me to the conclusion that I'd have to make some myself. My friend and neighbor Norm Papernick was very helpful with that project. Considering that neither of us had any real experience with tie-dyeing, and that I hadn't done nearly enough research on the technique, the results were surprisingly acceptable. 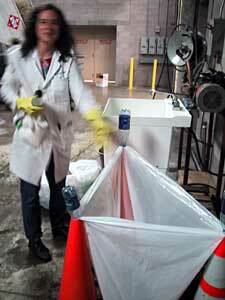 We began rinsing and crushing recyclables on Friday and continued to do that all day long on Saturday and Sunday. Russell improved the rinsing area by finding 3 traffic cones lying around the loading dock and using them to hold up a bag for the rinsed containers, which was secured by punching the necks of plastic bottles into the holes in the tops of the cones. Unlike at Origins, where we did the crushing in the concourse and were visible to people who volunteered to help, at GenCon we had to lure volunteers into the loading dock. We hadn't given much thought to how to make this happen, so we didn't get many volunteers. We're very thankful to Joel Fuce, Nic Hardcastle, Greg McMillin, and Lauren Budden, who took time out from the con to come behind the scenes and crush some cans! Booth Rabbit Marlene Bruce, Demo Rabbit Dave Chalker, and his girlfriend Alex Dudley also contributed their hopping talents. One of Russell's many accomplishments was arranging for a local recycling firm, Republic Services, to pick up the recyclables directly from us. This eliminated the concern that a public dropoff site (like the one in Columbus we have used for Origins) could be contaminated by someone dropping trash in it and all our effort would go to waste. Republic sent a truck to the convention center early Monday morning, and I helped our bottles and cans get on board for their ride to a useful future. "At home, in a burst of scientific curiosity, I emptied the water into a measuring cup. It totaled just over 20 cups—more than a gallon! […] I used it to water my plants." After that, I cut through the exhibit hall to get to the restroom. All the booths were long gone, except for the biggest exhibitors who were still packing up. The black carpet that had been under one of the hugest booths was thickly littered with recyclable containers. "Oh, leave them alone," I told myself. "You've done your part. Besides, the truck has left." But on the way back, I just couldn't stand to see so much going to waste. I picked up containers until I'd filled 2 boxes, which was as much as I could carry, and put them in my car. There were 39 plastic bottles and 4 aluminum cans (5 ski jackets and 80 hours of light) and most of the bottles were partly full of water. At home, in a burst of scientific curiosity, I emptied the water into a measuring cup. It totaled just over 20 cups—more than a gallon! I've never understood why anyone would pay for water when it's available for free from drinking fountains; I understand even less why people throw away clean drinkable water! I used it to water my plants. All in all, recycling at GenCon was worthwhile and a lot of fun, though very tiring. The Looneys and I are plotting some better publicity methods and ways of luring volunteers. 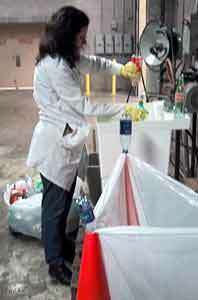 We're also continuing to work toward our goal of getting conventions to hire professional recycling contractors. Stay tuned! 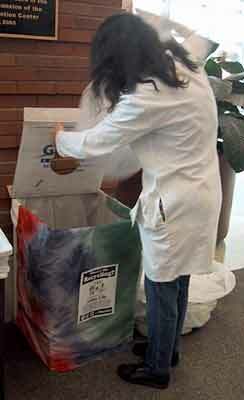 If you're a convention exhibitor or attendee, please contact con organizers and convention centers and encourage them to provide recycling services! In particular, if you attended GenCon, be sure to let them know that you appreciated having the opportunity to recycle! 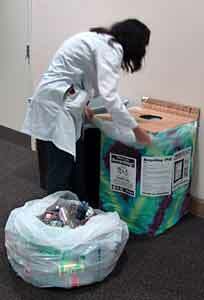 Thanks to GenCon for supporting our recycling efforts, and … thanks for helping us recycle!